Still pursuing my theme, “Beginning at the Beginning”, I want to emphasise the importance of working with the hands, seemingly rather obvious in relation to the manual therapies, yet we do not always give them the attention they deserve. The Eastern tradition regards the hands, and treats the hands, in a very comprehensive way, not only describing the complex relationship of the hands to the entire body system, through the networked channels and points, but emphasising the care of the hands in exercise, and their special role in maintaining the equilibrium and health of the whole body. The focus that we bring to the hands in the practice of the manual healing arts requires the most sensitive guidance. 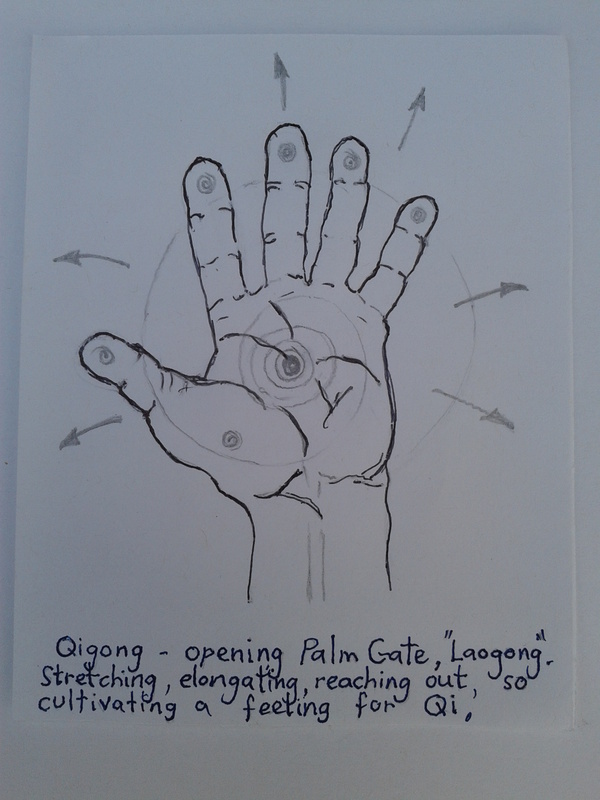 Qigong – Opening the palm gate and extending the fingers to open all the channels. If we wish to develop the subtle, responsive capacities in our work with others, we must recognise and explore the hidden powers held in the hands themselves – through stretching, opening, feeling and breathing – right to the fingertips and beyond. Clearing first: Firstly we can consider the role of the hands in leading accumulated tension and stress out of the body as well as other toxic influences. 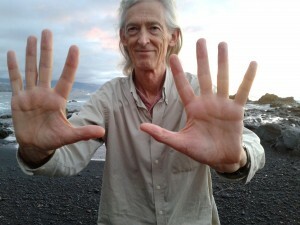 In the theory and practice of acupunture, all points at the finger-tips are considered as “Exit Points”; also points near the knuckles of the hand, whether “extra points” or pertaining to the traditional meridians, are used for cooling Heat, eliminating all toxic excess, and for releasing stagnant Qi. 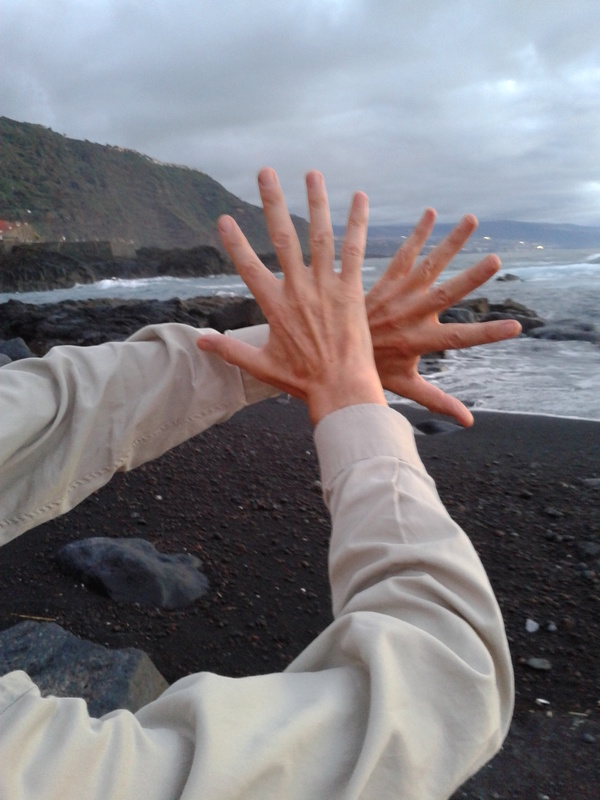 So, in the practise of Qigong we should also pay special attention to the hands. 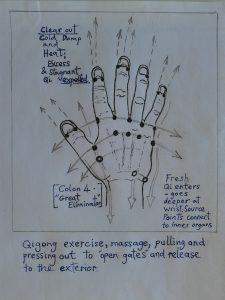 Here the principal and secondary gateways of the palm and fingers also serve as “exit points” to eliminate blocked or stagnant Qi from wherever it is lodged. It is important to relax the chest, shoulders, neck and jaw – to release chronically held tension in these central areas. It is always helpful to let our elbows sink down, but at the same time we should work to stretch open the palms, to separate and extend the fingers and open the joint spaces, so that the emphasis shifts to the extremities. 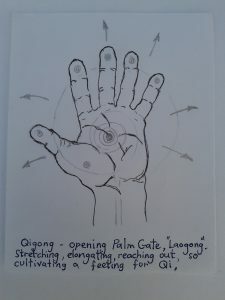 It is especially important for manual therapists to practise opening “Palm Gate”, the powerful point of focus and feeling in the centre of the palm. A little extra physical and mental effort is applied to push the Qi through. 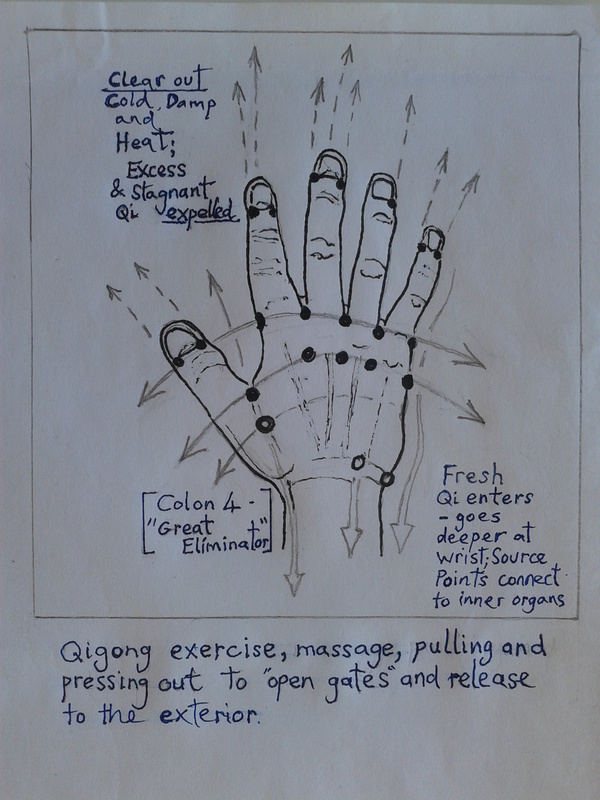 Alternately stretching and then relaxing the tendons and ligaments of the the hand opens the gate to expel any excess, and also improves circulation of intrinsic Qi on the interior. This forms an important part of the healer’s project. We want to align and unify ourselves with the energies of the Cosmos and strengthen our intrinsic Ki, but purification comes first, and it is a continual task. In Daoyin qigong, whenever you exhale, practice breathing out via the fingertips. Daoyin means practising yin and yang harmony. As we make a certain amount of effort, we can also learn to relax and let go, breathing out fully and completely. The breath then returns by itself – we are automatically recharged with fresh Ki. Sometimes we can see and experience the temporary effects of shifting the various pathogenic influences according to their characteristic nature or cause. So Dampness, Heat and Cold, or stagnation due to strain or repressed emotion can all be released, and the hands and fingers could become swollen, numb, sweaty, hot or cold, during the course of practise; also changing colours – white, red, yellow or bluish tinges – may be observed. At the end of a practise session, we can vigorously shake the wrists and hands; also we can use massage at any time, working along the channels out over the hand and palm and along each finger to the tip, applying pressure or squeezing with the thumb and finger of the other hand to aid the release of any toxic influences, and finish the job with satisfaction. Working in this way on ourselves, little by little, we can perhaps become better agents for healing others. PL.